Louis Armstrong reached his artistic peak somewhere before 1929, when his recording of commercial songs — I CAN’T GIVE YOU ANYTHING BUT LOVE as opposed to POTATO HEAD BLUES — was ruinous. Right? You play what you are! And Louis in 1954 and 1960 still embodied the deepest human truths of joy and sorrow. These two videos are now available widely thanks to the tireless collector, historian, and archivist Franz Hoffmann. “YOU ARE THERE: “THE EMERGENCE OF JAZZ,” which purports to recreate the closing of Storyville as if it were a news story happening at the moment. In 1954, I wasn’t sufficiently sentient to have been watching this episode, but I gather that this neat gimmick allowed various actors to recreate events in history — with light brushes with accuracy and the help of Walter Cronkite to make it seem “real.” Here, Louis was asked to become King Oliver, fronting his own All-Stars . . . all African-Americans, with the exception of drummer Barrett Deems, who had his face blacked to fit it. The other band members are Barney Bigard, Trummy Young, Billy Kyle, Arvell Shaw. In other segments, Louis Mitchell was played by Cozy Cole and Jelly Roll Morton by Billy Taylor. No doubt. Here, much of the fun is that the Oliver band is “challenged” by an offstage White band — the Original Dixieland Jazz Band — impersonated by Bobby Hackett, Bill Stegmeyer, Lou Stein, Cliff Leeman, and Lou Mc Garity. To see and hear Louis play BACK O’TOWN BLUES and read his lines is enough of a pleasure; to hear Louis and Bobby improvise on the SAINTS is a joy. Six years later, with no faux-news report, just a substantial production for a BELL TELEPHONE HOUR (January 1, 1960), we see Louis in magnificent form (although this segment is taxing). After SUNNY SIDE OF THE STREET and LAZY RIVER — with the plastic mute Jack Teagarden made for him — there is one of the most touching episodes of Louis on film, beginning at 3:30. If you ever meet anyone who doubts Louis’ sincerity, his acting ability, his skill in conveying emotion, please play them this video and let them hear and see the ways he approaches SOMETIMES I FEEL LIKE A MOTHERLESS CHILD, intensely moving. Then the mood switches to an early-television meeting of Louis with an unidentified vocal quartet for MUSKRAT RAMBLE. In all, eight minutes plus of wonderful music. Louis sustains us as he sustained himself. Thanks to Franz Hoffmann and of course to Ricky Riccardi, who has done so much to remind us that Louis never, ever stopped creating. The biographer’s chosen task is either difficult or impossible. Any competent researcher can amass a proliferation of facts, beginning with the subject’s grandparents and concluding with the coroner’s report. The more public the biographical subject, the easier the task, apparently. But although readers want to know the facts of the subject’s many lives — creative, philosophical, emotional, quotidian — the questions we want answered are deeper. I think we ultimately want to know what it felt like to be the person under scrutiny; why did he behave as he did; what choices did he make; what drove him? And since most of us are puzzles even to ourselves, the answers to these questions are often beyond our reach. 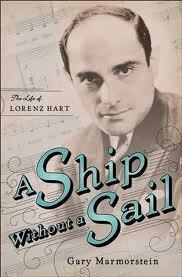 These speculations are the result of my reading A SHIP WITHOUT A SAIL: THE LIFE OF LORENZ HART, by Gary Marmorstein (Simon and Schuster), just published. Marmorstein does several things very well. For one, he has taken stock of everything written about Hart — a fourteen-page bibliography and hundreds of endnotes. He is admirably diligent and more thorough than the two Hart biographies that proceeded this book. The book moves along at a swift pace, although Marmorstein has chosen often to show that he is as clever as his subject, as witty, as colloquial — often adopting his own version of Thirties slang, where a man gets punched in “the kisser” and a failing business goes “flooey.” I wish his editor had told the author that referring to the troubles Richard Rodgers had with his collaborator as “Hart-aches” was not wise. That same editor might have limited Marmorstein’s usage of “must,” as in “Larry must have reacted with a jolt” when watching the sound film THE JAZZ SINGER when there is no evidence to support the speculation. To his credit, Marmorstein is more candid than his predecessors, although he does not dwell on scandal-mongering. He is fair to Hart’s collaborator, Richard Rodgers, who on one hand tried to protect Hart from himself and on the other, referred to him as “the shrimp” while Hart was alive and “that little fag” twenty years after Hart’s death. And where there is room for speculation, Marmorstein painstakingly balances opposing narratives. In these things, A SHIP WITHOUT A SAIL seems ideal. But Hart would not have been an easy subject under the best of circumstances, and the facts and myths of his brief life lend themselves to mythologizing. One such encapsulation of Hart’s hectic, creative, unhappy life is as (in Marmorstein’s coinage) the “lovelorn dwarf.” Hart was short, under five feet, and although he made and permitted jokes about his height, it was apparently not something he accepted, and it added to his perception of himself as irredeemably physically unattractive. Hart was a gay man in a profession where homosexuality was more common, but he seems not to have had long-term emotional attachments He kept no diary and had a habit of disappearing — at night and other times. Biographers before Marmorstein have speculated where Larry Hart got to, and with whom . . . but all the people who might have told us stories are dead. Commendably, Marmorstein shuns ancient homophobic formulations, suggesting that Hart drank himself to death because his sexual preference made him miserable, or that Hart chose to be gay because he was unattractive to women. I was eager to read A SHIP WITHOUT A SAIL in hopes that it would be a satisfying synthesis. What would its author make of the combination of Hart’s creativity and unhappiness? What was it like to be a man in public view who thought of himself as unattractive? What was it like to be a gay man who wrote memorable paeans in praise of heterosexual romance, to be sung in public by men to women and vice versa? What might this book tell us about Hart’s apparently self-destructive behavior? Having recently read and admired Michael P. Zirpolo’s MR. TRUMPET, his biography of the alcoholic genius Bunny Berigan, dead at 33, where Zirpolo successfully puts forth plausible explanations of Berigan’s drinking, gently and ruefully, I hoped that Marmorstein would do the same and more. Alas, the book ultimately is only a collection of engaging anecdotes in chronological sequence. One can learn what the Hart’s housekeeper and cook, Big Mary Campbell, said to Josephine Baker. One can read how Hart would not let anyone else pick up the check. One could buy Hart an overcoat in the boys’ department of Wanamaker’s. We learn the name of the nurse who might have been at his deathbed. Famous loyalties — Hart for Vivienne Segal — and emnities — Rodgers and Hart versus George M. Cohan — are entertainingly delineated here. And the book rolls on, page after page, year after year, show after show, from Hart’s lyrics in summer camp to his final words on his deathbed, “What have I lived for?” But the reader, closing this well-documented book, may feel that Hart, elusive in life, took his secrets with him. I first met pianist / composer Michael Bank about eight years ago and was impressed by his swing playing and his uncliched way of getting from A to B on the most familiar song. He always swings and he always surprises — but in a sweetly nonabrasive way. Often I heard him with Kevin Dorn’s bands, and he was not only a fine soloist but a perceptive, supportive ensemble player. Most recently, I caught him, guitarist Matt Smith, bassist Murray Wall, and drummer Giampaolo Biagi at the Brooklyn jazz club Puppets, where he offered some standards but a number of intriguing originals. I was delighted to learn that Michael would be bringing his “Big 7” (an octet, if you’re keeping track) to the very pleasant East Side jazz club SOMETHIN’ JAZZ — 212 East 52nd Street, between Second and Third — last Saturday, May 5, 2012. I knew some of the members already: Simon Wettenhall, trumpet; Murray Wall, string bass; Matt Smith, guitar; Steve Little, drums — and others were very pleasant surprises or affirmations of what I already knew: Sam Burtis, trombone; Mike Mullens, alto saxophone; Paul Nedzela, baritone saxophone. Michael’s compositions often have elusive names but their melodies don’t run away from the listener. And to my ears they inhabit a spacious universe that looks back to Willie “the Lion” Smith and off to the left to the Birth of the Cool, visiting the Keynote and the Vanguard studios, saying Hi to the 1938 Basie band and the 1940 Ellington orchestra — but without a hint of archaeology or “repertory.” Modern swing is what I call it — and I am entirely aware of how those two words are weighted in jazz talk. All I know is that I was smiling behind my video camera, with a multitude of delightful surprises entering my consciousness, and wanting to tap my foot. You will hear why! And — just to state what should be obvious — SOMETHIN’ JAZZ is a wonderful place to hear music. I encourage listeners in the New York area to find this out for themselves. The first of Michael’s wittily titled originals is MINOR CHANGES. What a lovely sound he gets from his players! I had to leave before the final selection was concluded — but it was a rocking blues, both reassuringly familiar and full of surprising curves and angles. I love and admire this band. In my ideal world — which isn’t that far from realization — they have a steady weekly gig and I can bring my friends to hear them . . . soon, I hope! Maybe it was all because of the blue lights at The Ear Inn (326 Spring Street, Soho, New York City) last Sunday night, that things took on such a loose experimental flavor. More likely it was the presence of Scott Robinson — a free spirit who encourages others to drop their inhibitions in a corner and proceed bravely into unexplored realms. And Scott brought three instruments: his familiar tenor saxophone, his Hungarian taragota (originally owned and played by Joe Muranyi) — that sounds like a cross between a soprano saxophone and something else, while resembling a thick clarinet — and his German Jazzophone, a trumpet of sorts that is bent into the shape of a curved saxophone . . . with two bells, one open, the other able to be closed off for muted hallooing sounds. This isn’t to say that Scott ran over everyone else in the EarRegulars — it’s not his style — but he did inspire one and all. The other players were Jon-Erik Kellso, trumpet; Jon Burr, bass; Joe Cohn, guitar; and guests Elana James (of the Hot Club of Cowtown) on fiddle and vocals; Tim Newman on bass trombone, and Vinny Raniolo on guitar. You’ll hear a good many playful conversations (especially between old friends Jon-Erik and Scott) that take us well beyond the ordinary excellence one finds at The Ear Inn. Here are some highlights of a luminescent indigo get-together! SUNNY SIDE OF THE STREET began as a feature for Tim Newman on the bass trombone. Catch the Forties Ellington band riffs under him! When I dream about inspiration and creative camaraderie, I dream of the Ear Inn and anyplace else these players can be found! Posted in "Thanks A Million", Generosities, Ideal Places, Irreplaceable, Jazz Titans, Mmmmmmmmmmmmm!, Pay Attention!, Swing You Cats!, The Heroes Among Us, The Real Thing, The Things We Love, Wow! 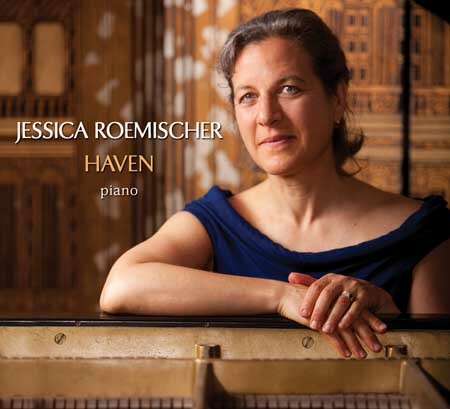 The imagination of pianist Jessica Roemischer is roomy and ranging. At the keyboard, she creates cathedrals of sound: visible, tangible, not just audible. Improvising on familiar themes — the blues, traditional melodies, folk songs, hymns — she may begin with plain-spoken melodic lines, simple chords. She doesn’t rush; she doesn’t intimdate the listener by jumping into complexities before the music is ready for them. She takes her time. A murmuring, rumbling bass becomes more turbulent water. Blue notes make themselves felt in surprising places. Her harmonies deepen; her chords grow more dense, each sonority given its own space to echo before a new cluster tumbles in. Single-note lines give way to arpeggios, creating impressionistic washes of sound and timbre. Clouds and rippling pools emerge from treble and bass; simple lines and chords become a conversation, then an orchestra. The listener sees something three-dimensional ascend towards the sky, its base solid, its foundation broad, its spires reaching upwards, large but never imposing. And her improvisations settle and become more quiet; then, the listener is back on the ground, enriched and delighted. I have heard and seen this in performance: she wove together the strains of SHENANDOAH and WALTZING MATILDA, slowing down the latter to match its American cousin, making the intertwined melodies both mournfully yearning and hopeful. AMAZING GRACE moved from quiet simplicity to great cloud-rhapsodies of sound and back to an eloquent plainness. Here is one version of AMAZING GRACE — but it is only one set of variations on a theme. Roemischer is a true improviser, bravely venturing, her vistas unrestricted, but always honoring the melody and its harmonic richness. Roemischer has a new solo CD, called HAVEN, which mixes traditional material, Sixties pop, Bruce Springsteen, and her own lilting originals. It’s a rewarding series of journeys, inward and outward. Visit her at http://www.pianobeautiful.com. Posted in "Thanks A Million", Generosities, Pay Attention!, Swing You Cats!, The Heroes Among Us, The Real Thing, The Things We Love, Wow! Abigail Riccards and Michael Kanan inspire awe and wonder. I experienced this first-hand in a small Brooklyn studio last Sunday, June 12, 2011, and share the music with you here. These two artists created music full of feeling but never “dramatic.” Each song had its own pliant shape, with unaffected casual intensity and splendor. Abigail has a speaking directness. Her mobile voice arches into long tones and soaring phrases; she lives within the lyric and the melody she is singing. She makes each song full of small peaks of intelligence and emotion. Hear, for instance, how she handles the words “drop a line” in Wilder’s I’LL BE AROUND. Her TOO LATE NOW is almost unbearably poignant yet it doesn’t whimper or carry on. Her approach is at once serious and joyous. BLUE SKIES cavorts. And although these songs are not new — each one has powerful ghosts standing behind the curtain to upstage the living artists — Abigail takes her own small liberties and makes them work, turning IN LOVE IN VAIN (one of the saddest songs I know) into something a little more resilient, in the same fashion that Billie Holiday recreated TRAV’LIN’ ALL ALONE as her own nearly defiant statement. Abigail’s singing touched everyone in the room: even in the videos here, you can feel their powerful quiet empathy and delight. I hear a great artistry. Michael is a poet at the keyboard with none of the pretense some have brought to that role. I think often of Jimmy Rowles when he plays, and at times of the witty, pointed spareness of John Lewis. Like Abigail, he never overacts, never calls attention to himself in some look-at-me way, but you can’t help but pay attention — both to what he is creating and what trodden ways he is wisely avoiding. His sound is lucent; his pauses are knowing and subtle; he is a master of light and shade and shadow. At its most serene and quiet, his playing is resonant. The art of accompaniment might be the most arduous of endeavors, and Michael is the most generous of partners, sweetly creating just the right sound-shape to make the singer or players around him seem even better. And these two artists create a delicate yet powerful musical world in duet — their playful energies complementing each other. They are gracious; they are polite; they don’t interrupt each other’s sentences, but together they make something wise and subtle and rich that wasn’t there a minute before. They offer and enact deep calm and brave experiment. Throughout this performance, I kept feeling it was an honor to be in the same room, a privilege to witness and record such art. I still do. Posted in "Thanks A Million", Generosities, Irreplaceable, Jazz Titans, Pay Attention!, Swing You Cats!, The Heroes Among Us, The Real Thing, The Things We Love, Wow! Walter Donaldson knew “what makes the world go round,” and it was displayed in many ways at Teddy’s (that’s in Williamsburg, Brooklyn, New York) on the night of May 19, 2011. Violinist Rob Hecht (he plays a five-string fiddle) was joined by singer / actress Tamar Korn, trumpeter Gordon Au, and string bassist Rob Adkins for a few sets of familiar music made new. I was there with the Beloved. and UK comrades Sir Robert Cox, his wife Bobbie, and sons Tom and Ed — representing the Empire most happily amidst barbecued spareribs and appropriate beverages. Here are seven performances from that evening: musicians in love with the music, creative artists able to focus on making beauty in the midst of an amiable crowd enwrapped in their own conversations. I make a point of the chatty crowd not to rebuke them — they’re used to background music. even if it’s coming from live musicians. But I applaud the unselfconscious integrity and focus of these (and other) musicians who shut out the distractions and go straight ahead, sending beauty and swing into the world even if the world seems not to pay much attention. Musicians know that there’s always someone listening . . . !